As of this morning, we now have ratings and reviews in the VS Marketplace! This will allow you to comment on your favorite (or least favorite) extensions and to see what other people are saying when choosing an extension. You can see a 5 star rating on each tile and at the bottom of each extension details page, you will see a list of reviews with comments. You, of course, have the ability to write your own. To limit spam and other abuse we require reviewers to authenticate with a Microsoft Account or Azure Active Directory account. Further, to the right of each review, you can flag offensive or spam reviews. 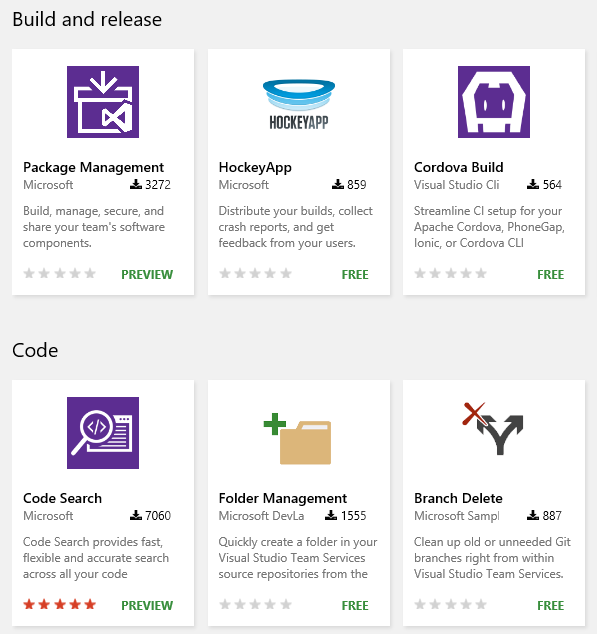 To be a bit more specific, these new ratings and reviews are for VS Team Services and VS Code. We’ve had ratings and reviews in the VS Gallery for Visual Studio extensions for a long time.